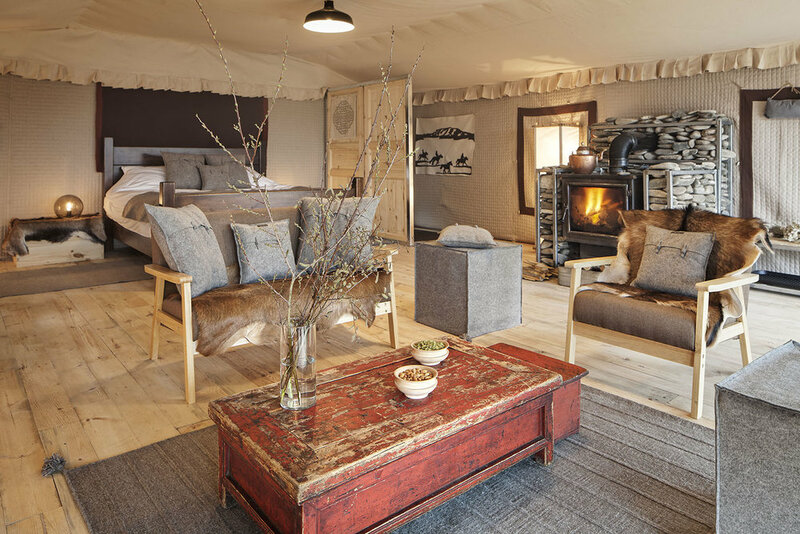 The camp comprises of six fully appointed Log Cabins, four Yak Khullu (Hair) tents, one Deluxe Yak Khullu Tent, one Log Cabin Suite, and one Yak Khullu Villa. All accommodations, including tents, have wooden floors and comfortable, quality bedding. They are tastefully furnished with accessories from Norlha Textiles, our sister company, and traditional style furniture as well as local antiques. The log cabins and tents are all heated with wood burning stoves. Made of pine logs and inspired by those found in the Tibetan woodlands, the Norden cabins measure 24 square meters and can accommodate king or double beds with an option for an extra bed. All have patios. They are constructed on platforms that make them as easy to move as the tents. Each cabin is equipped with a dry toilet based on a Finnish model that requires no plumbing. Showers are located a 1-2 minute walk away in the Shower House. Cabin accommodation includes three meals per day per guest. Log Cabins accommodate two guests (king bed or two twin beds), with bedding for an additional guest available upon request. Showers are a short walk away in the Shower House. Perfect for larger groups or families, the Family Suite Cabin includes two separate bedrooms each with their own ensuite eco-friendly toilet, as well as a large common area for relaxing and gathering. The Family Suite Cabin is 55 square meters. The Family Suite accommodates four guests (one king bed and two twin beds), with bedding for an additional guest available upon request. Three meals per day per guest included. Showers located a short walk away in the Shower House. A tent in the tradition of the luxurious dwellings of people on the move, where mobility does not compromise luxury. Traditionally woven yak hair tent lined in canvas, a light, airy 70 square meters including a washroom and a deck with a king size bed, stove, wooden floorboards and seating areas. A space enhanced with yak khullu soft furnishings, carpets, throws and wall hangings that exude warmth and comfort. 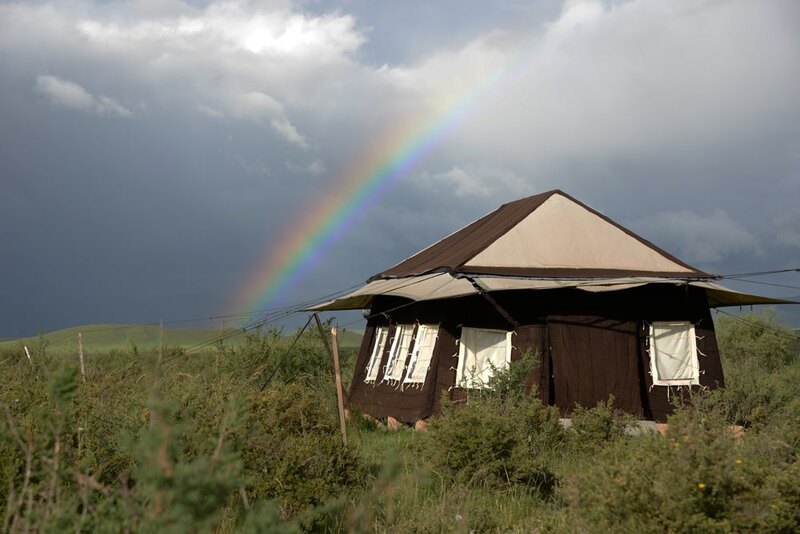 The Deluxe Khullu Tent accommodates 2 guests, with bedding for an additional guest available upon request. Three meals per day per guest included. Showers located a short walk away in the Shower House. Nomadic life on the Tibetan Plateau is based on centuries of experience in the natural world. Norden makes the most of the nomad’s ancestral knowledge, adding contemporary elements for maximum comfort. The Norden tents are all 18 square meters in size, and are made of handspun and handwoven yak khullu, the brown fiber of the yak's winter coat, in the traditional style of nomad tents. For added warmth, they are heated with wood stoves and the walls are insulated with a layer of locally made yak felt. They are built on platforms above the ground and have wooden floors, protecting the living area from humidity. Tent accommodation includes three meals for two guests per day (two twin beds in each tent; extra bedding unavailable for regular Tents). Dry Toilets are located adjacent the Tent. Showers are a short walk away in the Shower House. Located 10 minutes from Norden Camp, the Lungta Cooperative was founded by a group of Yidam's relatives from Tsayig. The owners of a herd of 140 yaks, the cooperative is a groundbreaking enterprise established to help find new ways for nomads to use their skills. Three exclusive, 24 square meter guest cabins reside within the cooperative for a unique, intimate experience of traditional nomadic life. 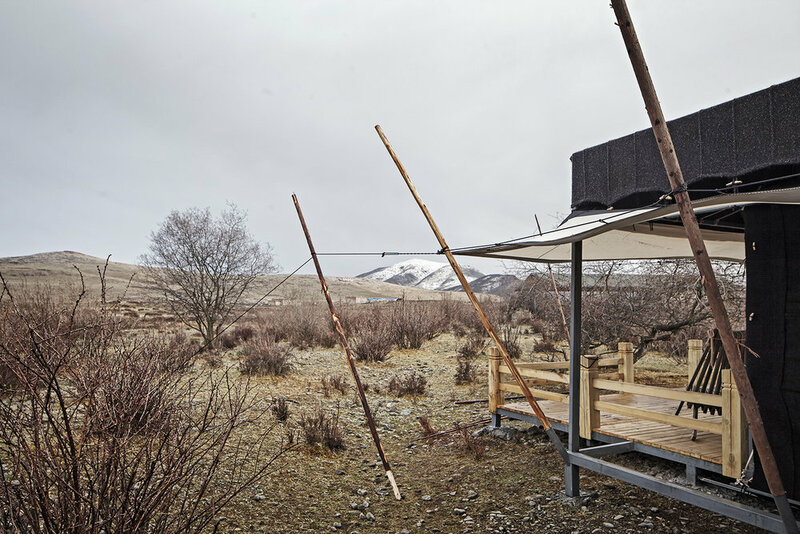 The Villa Tent is a house of fabric made from traditionally woven yak hair tent cloth lined in canvas, a light, airy 120 square meters with wooden floorboards comprising two bedrooms, a sitting room and a large washroom. Each room has a stove, its own deck with a view on the river and the nomads beyond. The space is furnished in simple wooden furniture accented with antique nomad pieces and enhanced with yak khullu soft furnishings, carpets, throws and wall hangings that exude warmth and comfort. The Deluxe Khullu Villa Tent accommodates four guests (one king bed and two twin beds), with bedding for two additional guests available upon request. Three meals per day per guest included. Showers located a short walk away in the Shower House. Thank you! A reservation specialist will be in touch with you.